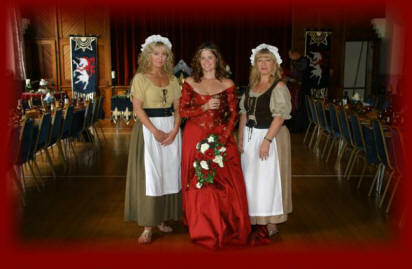 Lady Yvette and Lord Ansgar had chosen Hatton Village Hall in Warwick for their medieval wedding reception. Yvette had set ideas for her wedding day and her husband Ansgar being German meant half of the invited guests were to be treated to something they had never been to before. Fighting knights, medieval minstrels and medieval dancing were only some of the entertainment planned for their special day. 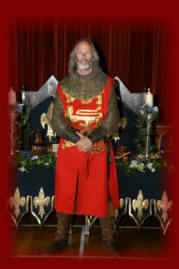 Yvette looked a vision in red and Ansgar every much the handsome knight to claim her hand in marriage. Ansgar tried to help some of his guests became an interpreter for some of the rules of the banquet which enabled everyone to join in the fun. 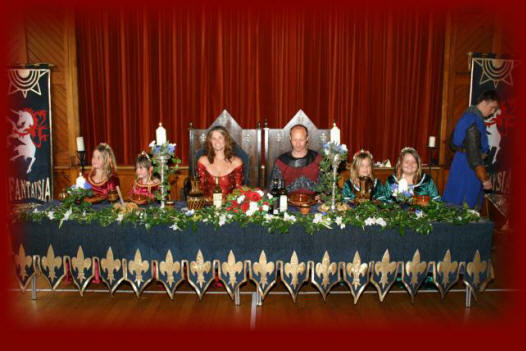 Yvette and Ansgar looked every part the grand couple seated in their thrones with brave knights to watch over them and as their guests were asked to beg for salt this was all good fun for the guests who were to participate in the rules of the banquet which included rules of the stocks. With a menu of spit roast pork, honey glazed chickens and honey baked vegetables the menu was much appreciated even if all the guests had was a wooden platter wooden spoon and dagger to help them through their step back in time. After the jester juggler fool entertained the guest with his foolery and Merlin the magician bemused the children there was the ultimate sword fight in honour of Yvette which the guests of both nationalities really enjoyed and understood. The royal minstrels then gathered everyone together for medieval dancing before the hand fasting ceremony. Everyone was the lured to a small cops across the road for a stunning hand fasting ceremony in the heart of a wood with an ivy covered floor and abundance of candles scattered to lead the way. This was to be the high light of the night where Ansgar and Yvette were bound together in front of all their friends and families in an age old tradition. Special bread was baked and as part of the ceremony was given out to all the guests to be part of their hand fasting ceremony. The forest was electric and a special moment happened for Yvette and Ansgar to seal their love and their amazing wedding day. To end the night the guests danced the night away to a robin hood themed disco and a display of English and German assorted foods and medieval ales and mead from the black rat tavern. Again the sun cast a heavenly glow upon Yvette and Ansgar's nuptial celebrations. 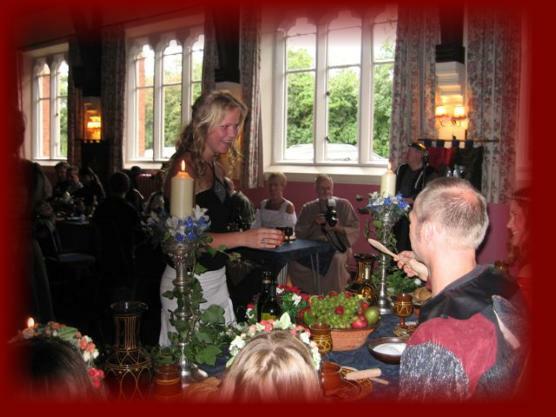 ''Just a letter to say an enormous thank you for creating an absolutely wonderful medieval banquet and medieval merry making for our wedding day. Ansgar and I thoroughly enjoyed ourselves on our special day and would not have wanted it any other way. My children thought the day was great and I am sure that extends to all children present. We have recieved many compliments regarding the day on how unusual and different the day was and how well enjoyed. In particular my father the wedding photographer and as a course of his work has attended many weddings and it was not just bias that found him to say that is the best wedding he has ever been to! 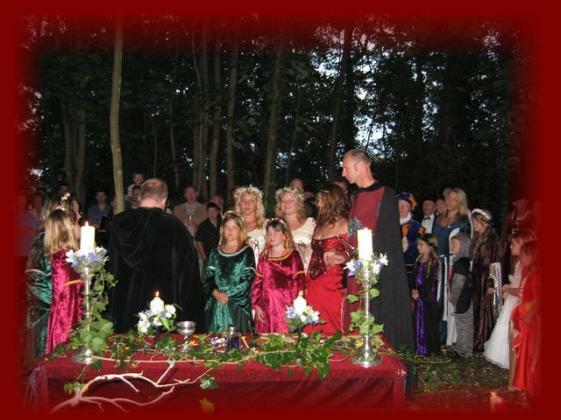 Many guest commented on how beautiful the hand fasting ceremony was. I'm so glad that we discovered the little woodland opposite it was a beautiful setting, I can easily say I would love to have the wedding again and would highly recommend Fantaysia to anyone who was considering a wedding or medieval party of any kind. The entertainment was superb and the organisation incredibly friendly.